Planning your trip down the Great Ocean Road? You simply can’t go past the sweetest spot on the map! When plotting an adventure down Victoria’s most iconic drive, the main problem is that there’s so much to see and do. And while that’s not exactly a bad problem to have, with most travellers working to a tight timeframe you’ll want to make sure you’re getting the most out of every minute. 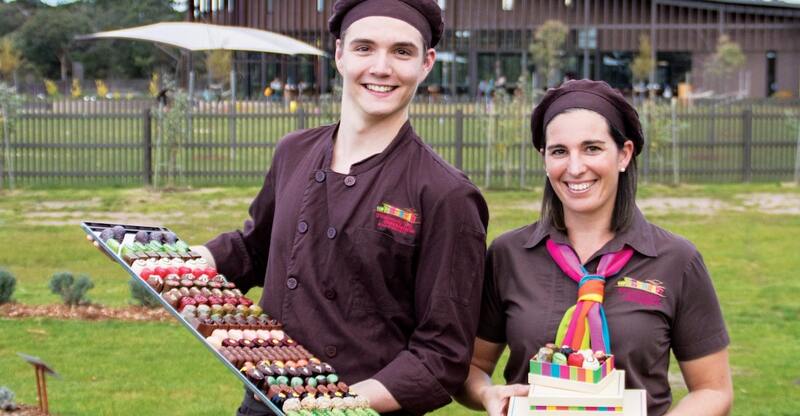 If you’re busy compiling your shortlist of top attractions, STOP WHAT YOU ARE DOING IMMEDIATELY and consider adding the renowned Great Ocean Road Chocolaterie to that list. This irresistible gem has something for the whole family to enjoy, and is perfectly positioned one hour from Melbourne, and right before you hit the start of Australia’s most scenic stretch of road. Its positioning along the route, particularly if you’re making the drive from Melbourne, makes the Great Ocean Road Chocolaterie the ideal place for your first pit-stop … an opportunity to recharge your batteries before going on to enjoy the mile-upon-mile of spectacular scenery waiting just around the corner. Once inside, indulge your taste buds with free chocolate samples on arrival, before enjoying delectable treats from the all-day Pod Café, its seasonal menu stuffed with savoury treats made from fresh produce, hand-picked from the kitchen garden (which you’re also welcome to explore). And the sweet-tooths in your party you’ll be relieved to hear the café has decadent desserts aplenty including fondues, mega-sized ice cream sundaes and Belgian waffles, while our pastry cabinet is filled with freshly-made tarts, tortes and gateaux from the expert hands of our very own French pastry chef. The kids will be fully catered for and entertained, with a special children’s menu, fun activity sheets, a sand play area, and an entire 15-acres in which to run riot and expend some excess energy before the long car journey ahead. And while the kids play, the bigger kids (that’s you) can take in the tranquil landscaped coastal setting while strolling through the on-site lavender field, native garden and emerging orchard. Something extra to think about … for the real chocolate enthusiasts out there, why not consider timing your stop to coincide with one of our regular free tasting sessions? Watch our chocolatiers at work as you see for yourself how world-famous, hand-crafted chocolates and artisan ice creams are made. Hear industry secrets, tips and techniques from professional chocolate experts and, of course, try a few sweet treats. And before you hit the road, finish up with a browse around the spectacular showroom, choc-full of tempting, hand-made treats. There’s literally thousands of handcrafted chocolates with over 200 different varieties, as well as 24 different flavours of freshly made ice cream, making it the perfect place to grab a little something for the road!